Everyone has their favorite meta-horror film, from big-hitters like Scream (1997) and The Cabin in the Woods (2012) to scrappier fare like Behind the Mask (2006) A Kid Like Jake and Tucker and Dale vs Evil (2010), and the appeal for genre fans is understandable. When done well, movies like these show an appreciation for horror movies made evident both in their genre knowledge and in the creative ways in which they twist the familiar. You Might Be the Killer is the latest film to take a stab at meta greatness, but while it starts with an irresistible premise it does far too little with the setup. Sam (Fran Kranz) runs into a cabin, barricades the door, and waits as the blood on his face begins to dry. Someone threatening is outside wanting in, and in a panic Sam does the only Leatherface thing he can think to do — he calls his best friend Chuck (Alyson Hannigan) for help. She’s busy working her retail gig but makes time for him when he tells her the camp is under attack by a crazed killer who’s already slaughtered several counselors. She asks the important questions — Has he called the cops? Yes, he left a voicemail. Does he know how many are dead? Yes, seven or so fellow counselors. Does he know who the killer is? 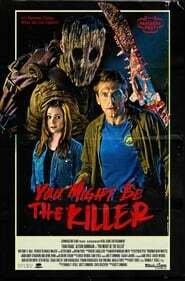 You Might Be the Killer is based on a now infamous Twitter exchange between authors Sam Sykes and Chuck Wendig (not linking for spoiler reasons, but it’s easily Googled), and the fun of the thread translates well to the first act of director/co-writer Brett Simmons and co-writer Thomas P. Vitale‘s slasher/comedy. It’s a fun take on the familiar as a character mid slashing takes time to reach Thunder Road out and phone a friend, and the banter between them is playful and rife with genre knowledge. We jump back and forth between now and flashbacks to earlier, and we watch the carnage unfold complete with a constantly updating onscreen body count that ups the levity even more. The limitations of the source material quickly rear their head, though, as the film is so front-loaded that there’s little to to celebrate in its back half. In 2009, writer and screenwriter Seth American Made Grahame-Smith had the brilliant idea of ​​adapting Jane Austen’s immortal novel, Pride and Prejudice, adding a more popular twist to those moments: zombies….